Wall-to-wall carpeting adds luxury and comfort to a home, but it can also harbor irritants like dander and dust mites which can exacerbate conditions like asthma and allergies. For your carpet’s optimum performance and your family’s health, we recommend regular cleanings — the frequency depends on the amount of foot traffic your house receives. 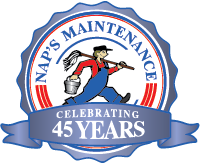 Nap’s Maintenance can take care of all your carpet cleaning needs. Our method of choice is forced hot water extraction. It leaves no residue behind in your carpet. This residue reactivates when your carpet dries, so the stains only fade, but never go away completely. Other carpet cleaning methods leave 80% of the soap in the carpet after cleaning, but the hot water extraction method only leaves about 10%. The result is carpet that smells fresh, and looks and feels clean. The carpet usually dries in 6-8 hours.